Considering the day-to-day use of your kitchen is essential to planning out a successful design for your kitchen remodel. If you don’t take your daily use into account or rush through design, you could end up with the refrigerator in the wrong spot, not enough counter space, cabinets that cannot be opened at the same, and a general flow that doesn’t work well for you. You could even end up without a space for your trash can! A kitchen remodel should improve the look and feel of your kitchen, but it should also improve the overall function as well. Taking the time to map out how you use your current kitchen and the frustrations you have with it can help your home improvement contractor create a design that works for you. Then, you can spend some time with them going through the new design to make sure every detail will help you enjoy your new kitchen that much more. You can even plan to hide your trash bins behind soft-close cabinetry, so they don’t take up floor space or become an eye-sore! No matter what you decide to do, planning ahead allows you to catch potential areas of friction during the design phase and adjust accordingly before it’s too late to make those changes. Storage is a common and sometimes ongoing problem for homeowners. It seems like no matter what you do, it can be difficult to find enough storage space for your stuff. When you start planning to remodel your kitchen, you get the opportunity to build plenty of storage opportunities into your new kitchen design. But, if you don’t plan for storage, you could end up with a new kitchen that does everything you want, except give you enough space for what you need to keep in it. Taking the time at the beginning of the process to plan for storage ensures you’re not disappointed or frustrated later when you can’t find space for what you need. When planning for storage in your kitchen remodel, you want to create a design where you can store everything you currently have and also plan for future storage. With all of the options available, you can remodel your kitchen to have plenty of storage even if you don’t have the space available for a huge walk-in pantry. The kitchen is often a busy hub of activity in a home. Not only does this usually mean a lot of foot traffic in and out, but it also means plenty of devices that need to be plugged in. Your major appliances need electrical outlets and so do your smaller appliances plus anything else you bring into the kitchen. Whether it’s a standing mixer, a hot plate, a tablet, laptop, cell phone, or something else, your kitchen remodel will need enough electrical outlets conveniently placed to handle all of them. By planning ahead and taking all of these things into account, you can ensure there are plenty of electrical outlets and charging stations available throughout your new kitchen in the right places to handle all of your electrical needs. Lighting is so important to a room. But, when it comes to kitchen remodels, it’s also often overlooked. If you don’t have the right lighting, your kitchen can be too dark or too sterile. You need to be able to see what you’re doing no matter where you are in the kitchen and planning for your current and future lighting needs allows you to get the right lighting for you. Implementing a mix of the right overhead, accent, and spot lighting gives you control over the amount of light in your kitchen and also provides the right light for you regardless of the task. Under-cabinet lighting is a great way to illuminate areas where it’s difficult for light to reach while track lighting or pendant lighting can illuminate larger prep areas. There is a lot of activity in the kitchen and whether you’re baking, frying, steaming, or just chopping up smelly stuff, proper ventilation is paramount. Not only does proper ventilation help you control smell, but it also allows you to control steam, smoke, and heat while you’re cooking. A ceiling fan, vented microwave, and an oven hood are great options to add some ventilation and air flow into your kitchen design. 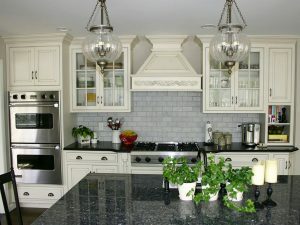 Kitchen remodeling is an upgrade to your home and it should also be an upgrade for you as well. Avoiding these common kitchen remodeling mistakes is a good way to start this home improvement project off on the right foot and ensure you end up with a kitchen that you will truly enjoy for years to come. Contact Zephyr Thomas at 717-399-4708 to talk about remodeling your kitchen!